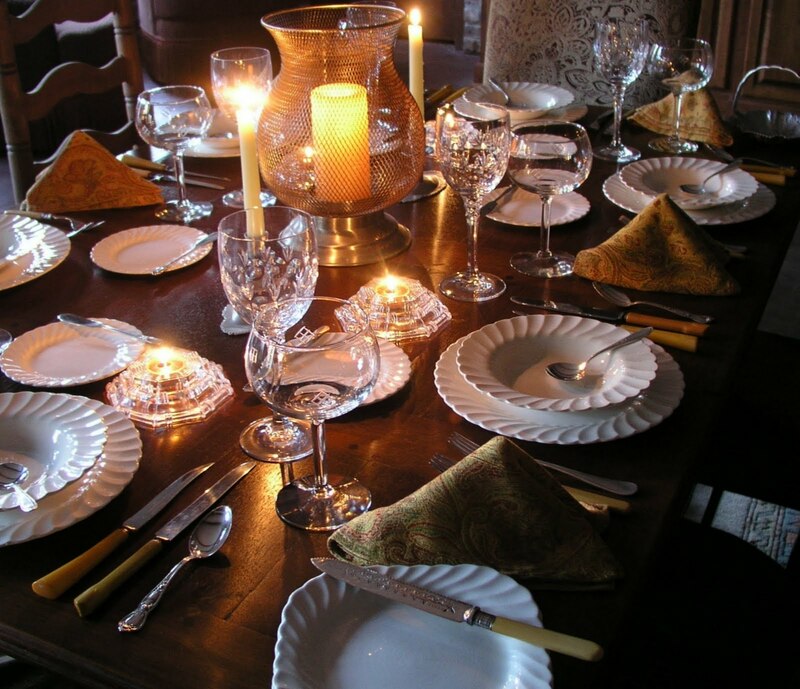 If you assemble it yourself, a centerpiece for a dinner party can definitely fall into the category of affordable accoutrements (accoutrements = outward forms of recognition; trappings). 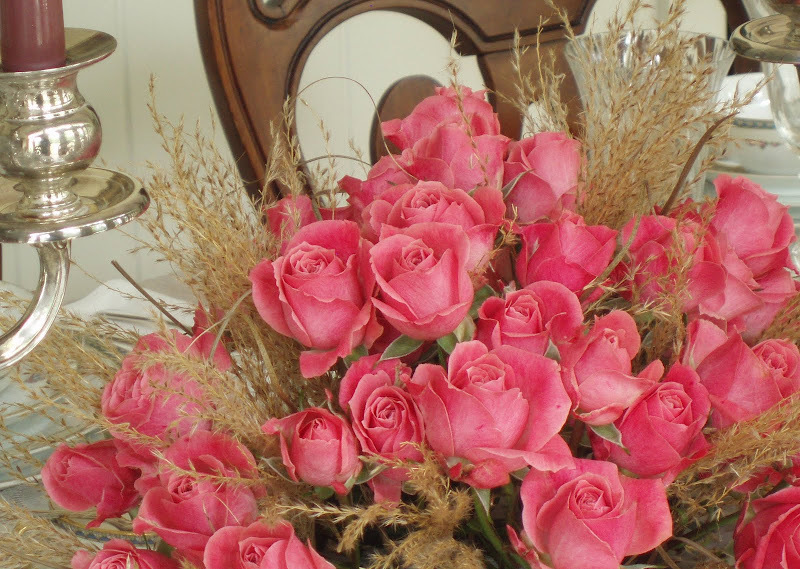 Arrangements created by professional floral designers can be relatively costly. If you want something very specific, you don't mind paying the price, and/or you're pressed for time, leaving it to the pros is always a viable option. I probably enjoy setting the table and assembling a centerpiece more than I enjoy preparing the meal (and far more than I like cleaning up afterward!). Today, I'm taking a look back at tables I've set for Affordable Accoutrements over the past year and a half. I selected representative photographs from 50 tablescape posts. Some of the ones I included featured multiple tables, so this represents more than 50 tables I've set for readers. That seems to be a milestone of sorts, doesn't it? Actually, what I'm "celebrating" is that I didn't set a table this week, and I wanted to participate in Tablescape Thursday with Susan of Between Naps on the Porch! A few of the tables like THIS "melancholy" one below lacked a true centerpiece. It could probably be better described as a vignette. THIS one had a family history theme. I incorporated copies of old family photographs, objects made by my brother using our grandfather's blacksmithing tools, and the family Bible (which went promptly back to its safe place as soon as I finished taking pictures). 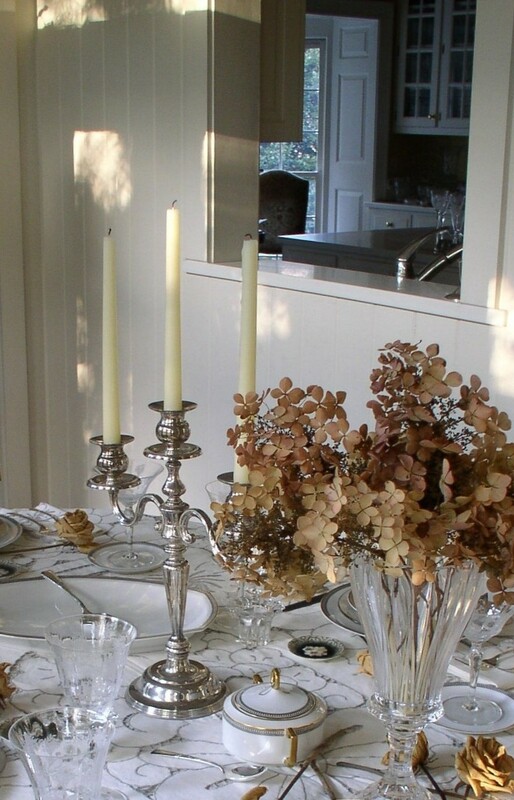 THIS table featured vintage aluminum serving pieces and what might be considered a secondary center of interest (the fruit displayed on the corner of the table). As I've often mentioned in past table posts, these settings tend to contain an element of fantasy. If the tables were being prepared for actual dinner parties, I wouldn't make the flower arrangements as tall as I sometimes do for tablescapes. It would make dinner conversation difficult, and guests would be made uncomfortable -- certainly not what the considerate host wants to do. A few of the tables I'm revisiting today actually were used for dinner parties. You can probably guess which ones, based on the fact that flower arrangements were below seated eye level. 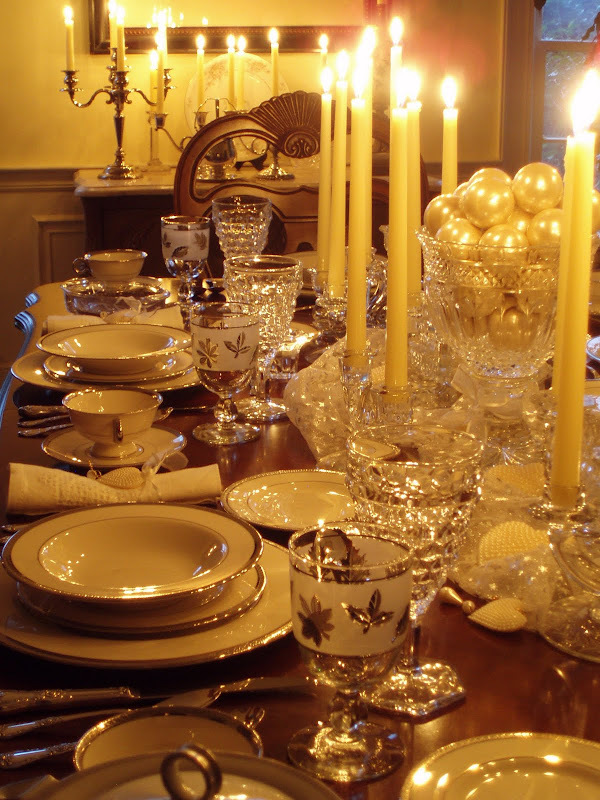 The first two images come from the very first tablescape post I did. 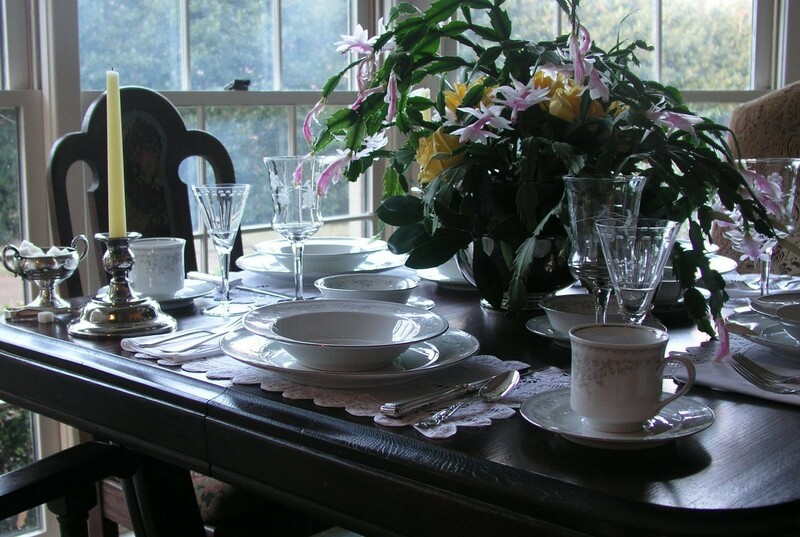 I called it "A Sentimental Setting" and used dishes and flatware that had been my mother's. I quickly assembled a casual arrangement of garden flowers. I almost left this one off my "résumé," but decided to let you see where I started (in terms of flower arranging and taking photos). My next table was set for two on the deck. A single rose was accompanied by strawberries, sliced lemons, and shrimp cocktail appetizers. I think a complicated centerpiece would have been redundant. The post is HERE. The centerpiece took over this table for two for "Christmas in July!" HERE's the post. A handful of simple daisies decorate this table for two on the terrace HERE. My first Pink Saturday post featured lots of pink and a crazy feather boa (what was I thinking?)! It's HERE. HERE's the same table with a much simpler centerpiece -- three silverplated Pottery Barn vases (from Goodwill) contain colorful summer geraniums. In the same post, I created cheerful mixed arrangements that included a variety of zinnas. The centerpiece of the third table featured one really beautiful (and very large) dahlia! Glowing candles show flowers, as well as guests, in a flattering light. Sometimes I mix supermarket flowers with homegrown ones, as I did HERE. Paintings can inspire centerpieces. I've been known to bring in artwork from other rooms of the house for a dinner party, as I did HERE. I mixed inexpensive store bought spray roses with plumes from the zebra grass outside. 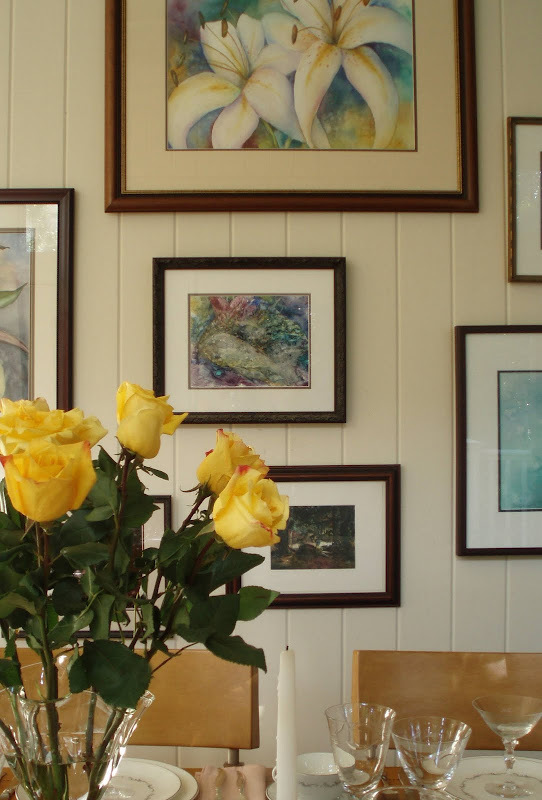 "Reduced for quick sale" yellow roses from the supermarket harmonize with a watercolor painting I did a few years ago (from a photo I had taken of daylilies). The post is HERE. Sometimes flowers aren't necessary (nor readily available). I like creating edible centerpieces composed of fruit and/or vegetables. In case you were wondering, the ones BELOW are faux. They only LOOK good enough to eat! The dried hydrangeas are back, along with scattered dried roses for "'Tis the Last Rose of Summer," HERE. Supermarket tulips, autumn leaves, a painting by my friend, Yvonne, and vintage Libbey "Golden Foliage" glassware were featured in the post BELOW. That was the week Affordable Accoutrements was named a Google "Blog of Note." I'm still not sure how or why the selection was made, but I felt honored. A virtual bloggers' dinner party BELOW included a tiara for Susan of Between Naps on the Porch! I recycled the roses from the "coronation" post by inserting them in a Christmas (Thanksgiving?) cactus HERE. I don't always use fruit OR flowers. I filled a heavy glass compote with Christmas ornaments that resemble large pearls (and lit lots of candles) for the post BELOW. 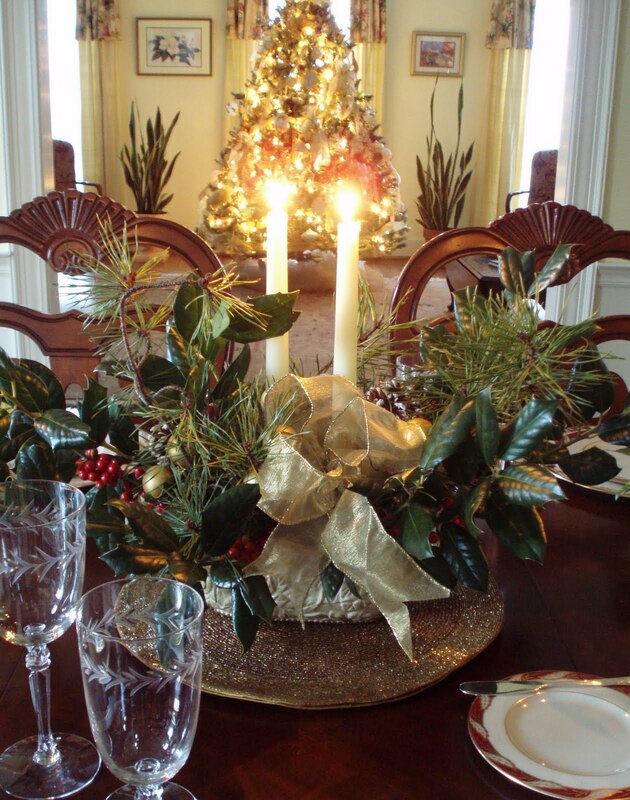 What's easier, and more affordable, than holly, pine, and boxwood in the arrangements BELOW? HERE, I recycled the container, bow, ornaments, and oasis from the Christmas arrangement above to create the dried centerpiece below (just add Hummels!). 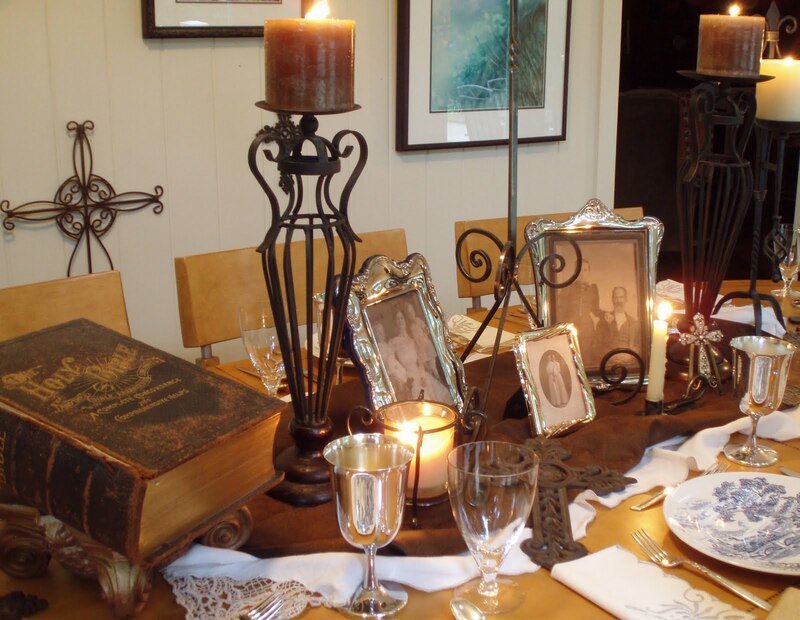 A pillar candle (in a wire mesh candleholder) and a few tealights seemed sufficient to decorate the table BELOW. Magnolia leaves, gumballs, Oregon-grape (Mahonia), and floating candles in silver punch cups comprise the arrangement BELOW. I quickly learned not to leave this one unattended -- the whole thing almost went up in smoke! A lantern-shaped pillar candle from Goodwill, tealight candles, and tapers in thrifted ceramic candleholders provide warmth for a cold wintry evening BELOW. A potted orchid (a gift for a neighbor) was pressed into temporary service as a simple centerpiece BELOW. Wrapping the clay pot in a cloth napkin softened the presentation. Reduced supermarket roses with cuttings from the garden (Aucuba japonica 'Variegata') are arranged in thrifted milk glass containers BELOW. The first daffodils of spring mix well with crocus blossoms and fern BELOW. A week passed, and daffodils were plentiful, as evidenced HERE. 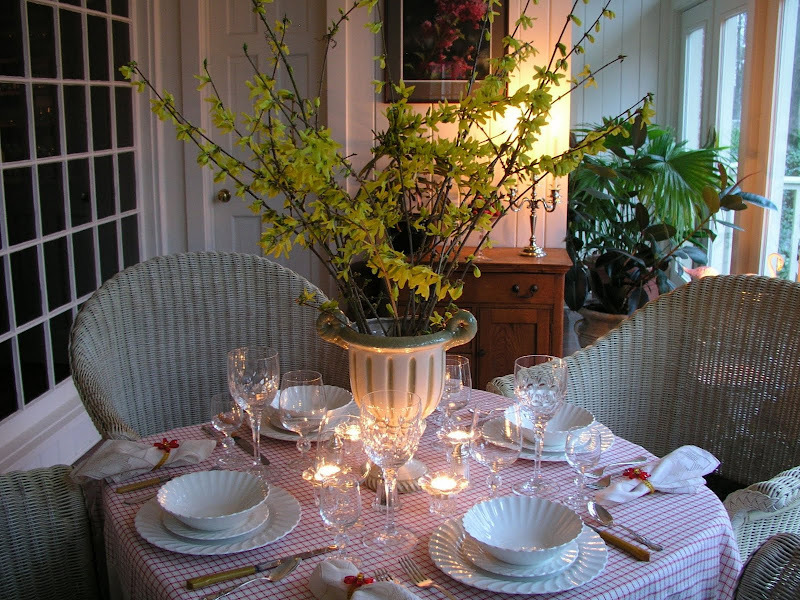 Forsythia branches provided a simple, but dramatic, centerpiece BELOW. This is the evening look that featured a reversible tablecloth and beaded napkin rings by April Cornell. Here's the daytime version, with strawberry motif. I wrote a short work of fiction to accompany the table below (or was it the other way 'round?). You can read about Mrs. Rivard's second chance for romance HERE. The flowering tree branches had an odd fragrance, but I loved the way they looked. I challenged myself to set a table that cost a total of $100 HERE. I came very close; the biggest challege was keeping the candles from tilting (pretend you don't see the ones leaning in the photo below, OK?). 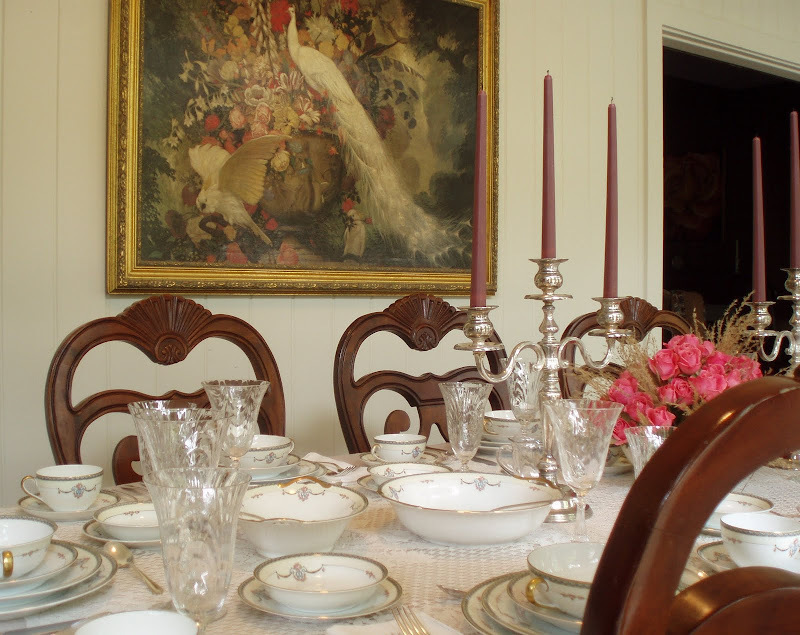 And THIS one for a tour of an historic home in Bolivar, Tennessee. 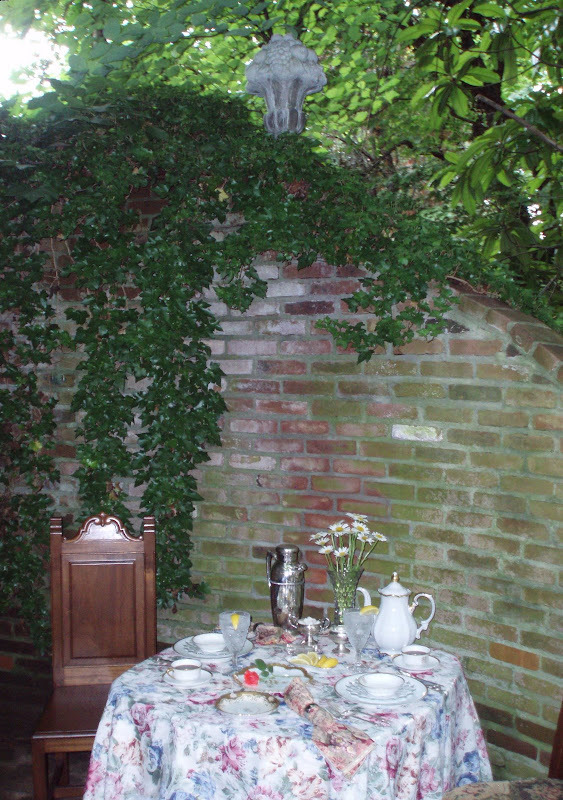 THIS table for two on the deck featured roses, azaleas, hosta leaves, and native clematis. I love sitting on the front porch on lazy summer evenings. 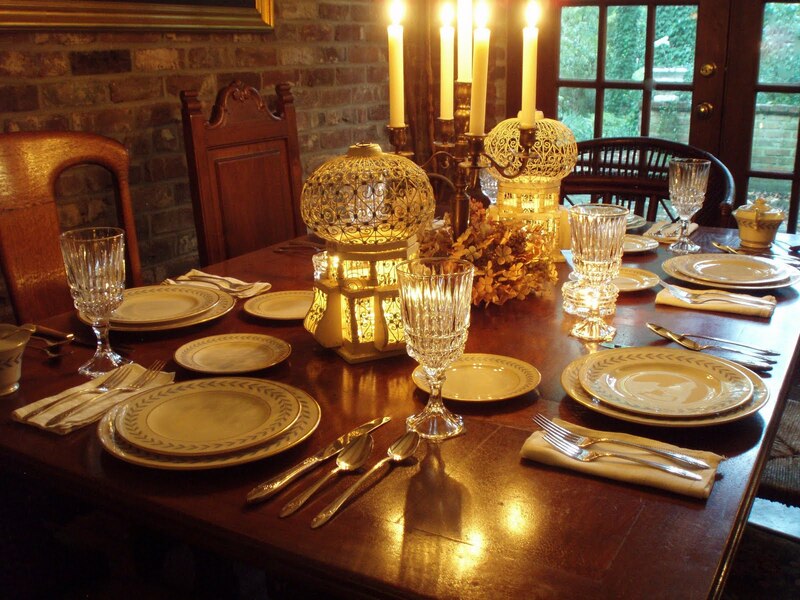 Why not set a table like the one BELOW for a late night supper or a light breakfast? THIS table for 4 in the sitting room featured a centerpiece that included plumes from purple fountain grass, jokingly described in Southern Living as being inducted into the gaudy plant hall of fame. I like everything about purple fountain grass, except the fact that it isn't cold hardy in this growing zone. It makes a great "thriller" in a mixed container garden -- as in a thriller (tall, dramatic plant in the center), filler (what it implies), and a spiller (flowing, trailing plant spilling over the sides of the container). By mid-summer, crepe myrtle was one of the few colorful blooms available. This coffee table setting for two can be seen HERE. More crepe myrtles, daisies, fern fronds, and English ivy appear in the centerpiece BELOW: A handful of lantana in a bud vase seemed sufficient for the table BELOW. 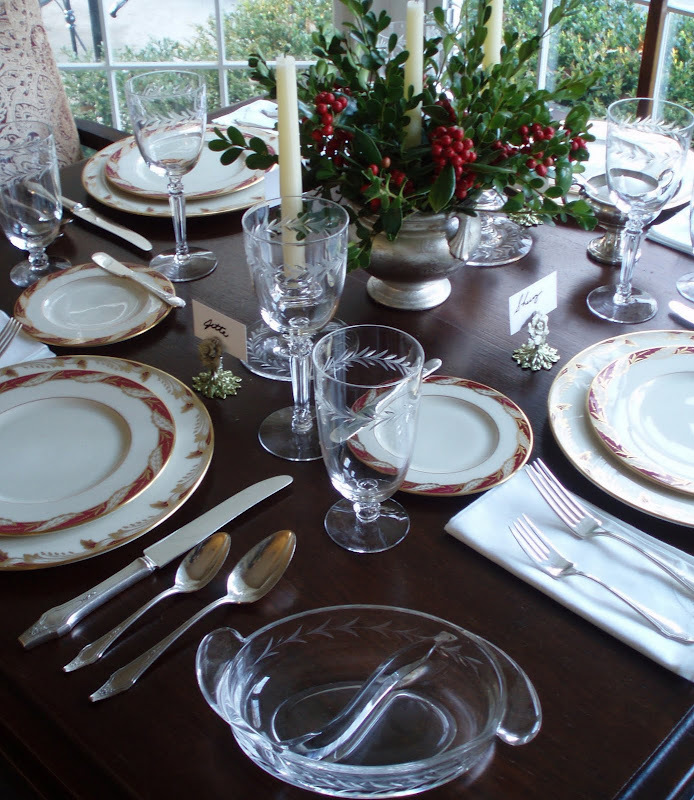 It featured items that might have been used by our mothers, aunts, and grandmothers for their "Sunday best" tables. I was scrambling to find something blooming to include in a centerpiece HERE. I ended up using crepe myrtle, hosta blossoms, and Rose of Sharon (Althea, Hibiscus syriacus). For THESE tables, I opted for a minimalist look, with single fern fronds in silver cups at each place setting. I continued that theme HERE, with Tropicana canna leaves and crepe myrtles in thrifted white milk glass bud vases. Shrub roses and zebra grass plumes were used to create THIS "fountain/fireworks" effect. A (greatly) reduced supermarket bouquet HERE proved to be a worthwhile investment. 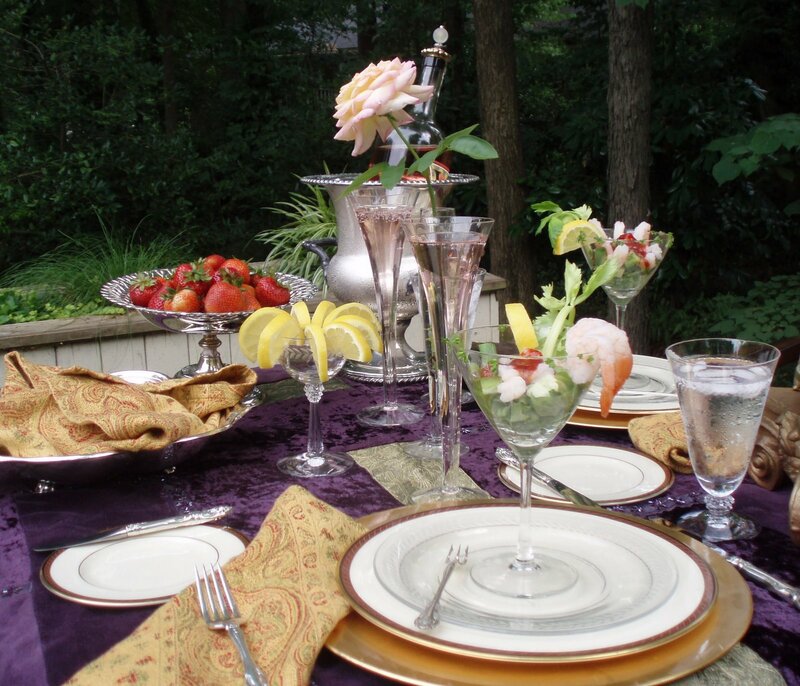 For the same post, I set a second table in the sunroom and used fresh fruit in the centerpiece. I recycled the supermarket bouquet into three small arrangements HERE. The kitchen island provided space for serving a buffet style meal HERE. The arrangements consisted of magnolia leaves, zebra grass plumes, and supermarket tulips. My most recent table was inspired by April Cornell's exotic and beautiful table linens and Komali Nunna's book on Indian cooking and entertaining for American audiences. You can see the post HERE. Hardy mums, zebra grass plumes (from the previous week's arrangements), and lamb's ear foliage provided the colors and textures for the look I wanted. I hope you've enjoyed stopping by today. Thank you for your visits. I appreciate them more than you know. 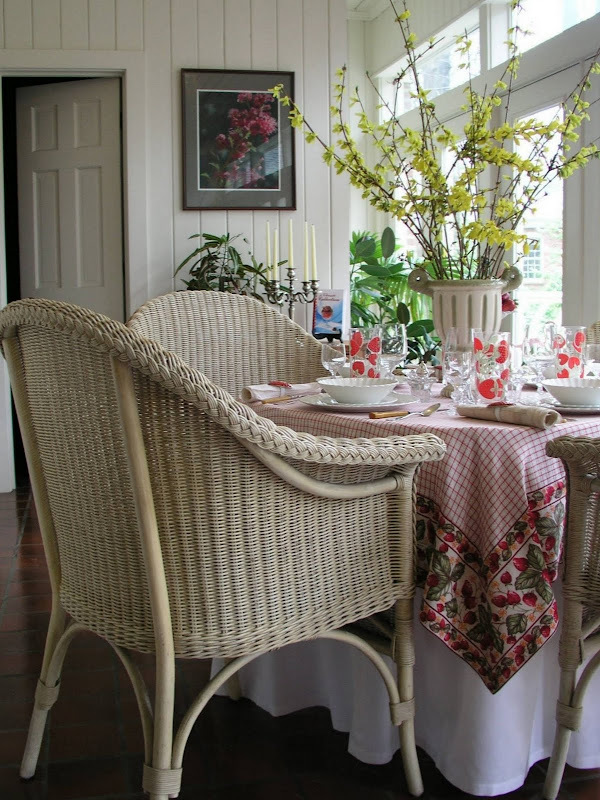 Please join Susan of Between Naps on the Porch for Tablescape Thursday and every week. You'll be very glad you did! 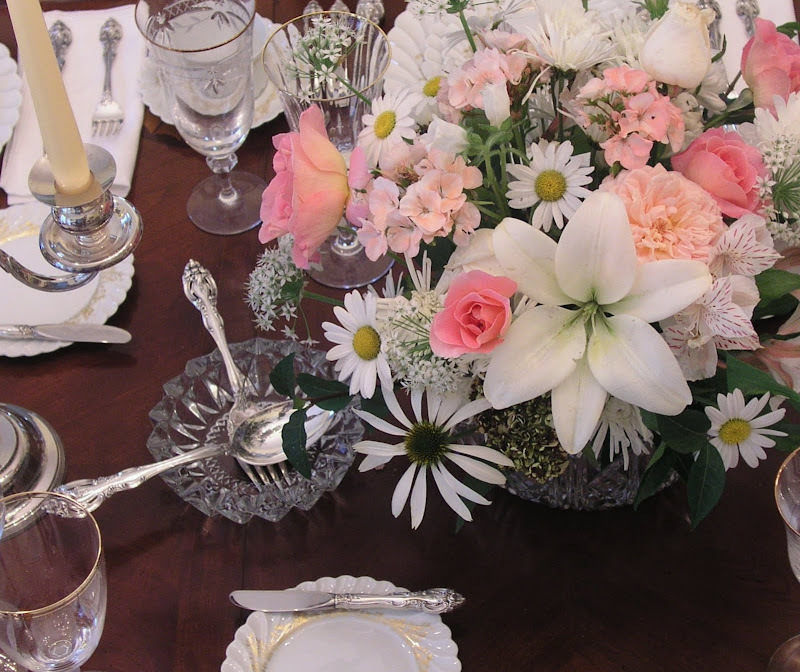 Speaking of centerpieces, our friend Pinky (a frequent Tablescape Thursday participant via RMS) has a brand new blog! It's Designs by Pinky and you can find it HERE. It's only two days old, but she's already posted two beautiful fall arrangements. Pinky's a professional floral designer, so we can look forward to lots of great centerpiece inspiration from her. Today is her 43rd wedding anniversary, so I hope you'll stop by and congratulate Pinky and her husband, Joe. I just signed up to follow ... hope you will too! the review on your tables is breath taking. I remember a lot of your tables, each and every was an eye candy. I learned so much by viewing your tablescapes. Most of your center pieces are fresh flowers. I really love that. Gasp! All just SO beaautiful, I really couldn't choose a favourite. You've certainly posted a Masterclass here Bill. I've book-marked the page for future inspiration....Thank You. Beautiful review Bill. I enjoyed seeing these gorgeous centerpieces and tables, again. Bill, all of your tables are stunning but the one you did at Bolivar is just breathtaking...that one has always been my favorite! Thanks for showing these again. Thanks so much Bill...your post could not have come at a better time. I have been entertaining a bit more and have been in a little slump when it comes to centerpieces. It's always about height to me, as you also say, which can interfere with the conversation, and the fact that my dining table is small and can only fit 6 at most, so the centerpiece must be on a small scale. SO, that being said, I was totally inspired as I scrolled through your review of tablescapes. Fabulous post and thank you again! All are beautiful. I can't pick a favorite. Maybe a top ten but that would be hard. Always enjoy your posts. You have such talent! All of the looks are so stunning. I love visiting your table settings. To many beautiful ones to choose from. Wow! You are amazingly talented. Love how you mixed yard clippings in with roses! You make all the centerpieces look like a celebration of the beauty of nature!!! I'm glad that I'm not required to chose a favorite. They are all so beautiful. The one of the wintery (snow on the deck) was one of my favorite pictures. Oh wow. I cannot believe how much time I spent looking at each little detail on every photo. Your tables are amazing. You certainly have a blessed gift. Thank you so much for sharing with us. I loved seeing them all. What fun to visit all these tables again to study the centerpieces! My all-time favorite (of those in this post, anyway) is the one incorporating the silver punch cups. Definitely one I want to copy! Bill....great idea! This was just so so special looking at your wonderful work! I have to say it took a while for me to get through all these because I kept going backward as much as forward. Every time I "thumbed" through I see something different. Have you ever thought of publishing a book....these are perfect! Thanks so much for I ALWAYS look forward to your tables! Beautiful flowers arranged so well. Very nice retrospective, Bill. Just beautiful. I could never pick a favorite! We went with friends to Arcadia, FL - a real antique town with lots of antique stores. 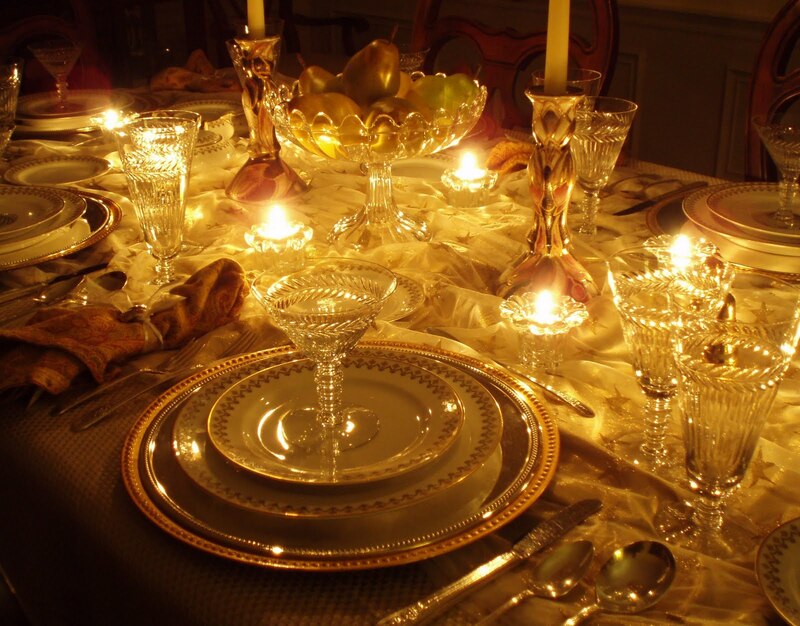 I found some caprice candlesticks and I found a service for 12+ of silverplate in the Exquisite pattern by Rogers. Fun, fun. THANK YOU, THANK YOU, THIANK YOU SO MUCH!!!!!!!!!!! THAT IS SO NICE OF YOU TO PROMOTE ME LIKE THAT! I SO APPRECIATE THAT! YOU ARE THE BEST, BILL!!!!!!!!!! Hi Bill, thanks for the review of all our lovely tablescapes. It's been a real treat seeing them again. Thanks for stopping by my blog and leaving your kind comments. And just to put you out of your misery: special chocolate covered biscuits and flavoured teabags. Shhhh, don't tell anyone, lol. I haven't been participating weekly with Tablescape Thursday but it's good to see these beautiful scapes this week. I love the light that reflects off the crystal. I started making notes of my favorite pieces/ideas but stopped after I had written 7 things and only gotten a third of the way through the post! I love seeing "where you started" and how far you've come! The Family History one may be my favorite ever. I also love everything you do with the grasses, like the roses. The dried Hydrangeas were cool. I always throw mine out, but I may keep them now. The pieces with them are elegant and a little longingly sad. I love the use of the leaves on the "Google Blog" and the glasses with the leaves on the "pearl" blog are gorgeous! They match the "pine cone" looking glasses well. I also think I recognized a few pieces of China! This post must have taken you awhile! All those links! It was a good one and well worth your effort! The breath of beauty! The height of elegence! The depth of richness!!!!!! I am just so enthralled by each and every table. 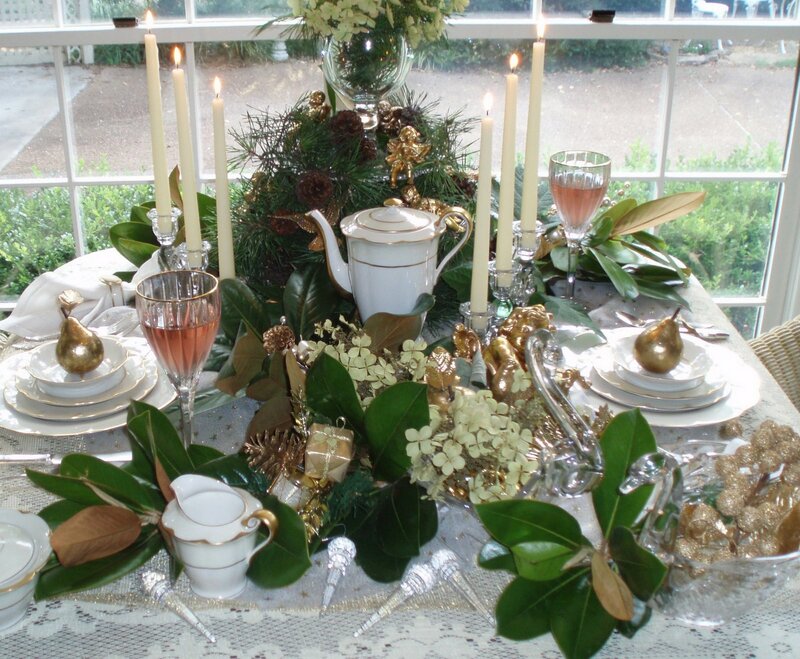 Holly in pewter, long branches of blooms in crystal, garden flowers in ironstone and lots of magnolia. Bill, you are a true artist. 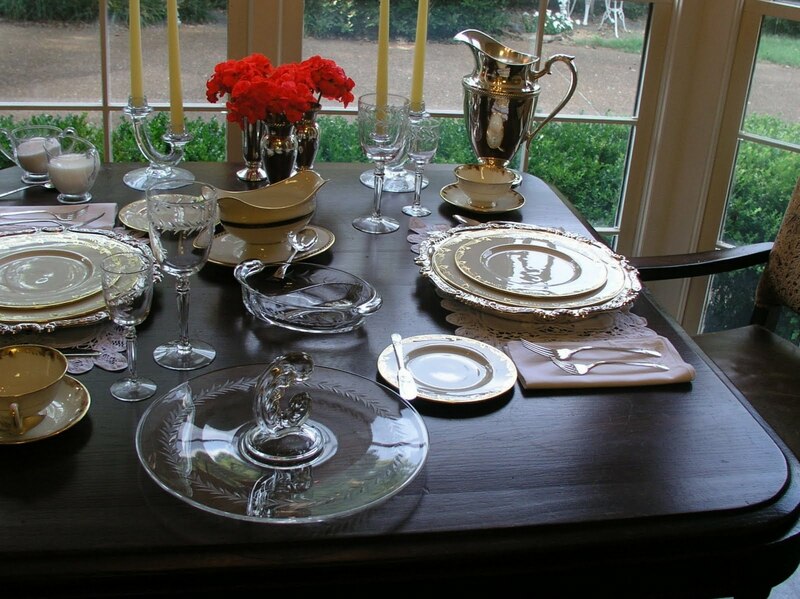 You take vintage crystal, dinnerware and linens and spin your magical spell with them! There is no one else that sets such astonishingly gorgeous tables! You really should write a book! I would truely love to meet you in person. YOur tables speak to me of tasts and a gentleman's fine breeding. I just love all that you do... it is so reflective of who you are!!!!! It is always a great delight to visit you! Oh, I enjoyed reviewing your tablescapes again! I think I have seen most of them, but a few I either forgot, or missed them! I could never choose a favorite! They are all great! I still think you should publish all of them in a BOOK! The photography is certainly good enough, and your stories wonderful! Wow, I will come back to this again and again. Couldn't take it all in at once! Everything is just so lovely! This review was pure Heaven, Bill. Thank you! I need time to REALLY enjoy this post! I am coming back with my morning coffee for look number 2. Your creativity is extraordinary. Really, it is. What a wonderful retrospective!! Your centerpieces are amazing and it's great to be able to see all of your tables again! Thank you for your talent and inspiration! Bill, what a treat to see all these gorgeous center piece beauties all in one post. No question that I'll be popping back to this one for inspiration many times. Bill, You touched my favorite topic, creating the centerpieces. I enjoyed your post very much as I always do. I will come back again to enjoy it leisurely. Such a wonderful trip down memory lane. You have such a wonderful way with centerpieces. It's one thing to be able to pull from your garden all Summer long, but the way you pull together centerpieces all year long is just an art form. Wow!! Looking back to see all your works is amazing! Speaking of centerpieces- you have a good eye for some very distinctive and different offerings! Have a great week! whoops! sorry, that last comment was from me, Nana! Such a lovely assortment of centerpieces. So inspiring. I'm now following your blog in order to be further inspired. What a wonderful trip down memory lane with you! Each table is a work of art, and I love the enthusiasm you have! You have a really good eye, and I always love your submissions. Seriously, though...do you camp out at the back door of the Goodwill and inspect each box before it's donated to get all the good stuff??!?!?! :-) I have NEVER found so much cool stuff as you have been able to procure at Goodwill!!! I have MAYBE found one really great thing there. I hit several different ones, but I'm never able to do the happy dance afterwards! :-( At any rate, I LOVE your tables and I wish you and yours a wonderful Thanksgiving holiday! As always an inspiring post. I remember so many of them and seeing them together is a great impact of inspiration. All the treasures you find are put to good use. Have a Happy Thanksgiving. I enjoyed your review of your beautiful tables. Since I am new at blogging(June)I never saw some of them. I especially loved your first two, knowing we all started somewhere. You are very talented. They are all a work of art. I know your guests feel special when they come to your home. I love the simplier tables, they seem so elegent. You are so inspiring and I thank you! Bravo to you!! I so enjoyed seeing these again -- you have such an eye for lovliness Bill. Have a delightful Thanksgiving. Bill, as always, you are an inspiration. You have made me look at what's blooming at my house in a new way. It is a no brainer to use the roses and mums but you have made me look at the smaller, less showy flowers that I have growing. I have had fun experimenting with them. Thank you. I am absolutely stunned by all of your creativity and beauty. What a perfect post to pen prior to the holidays. 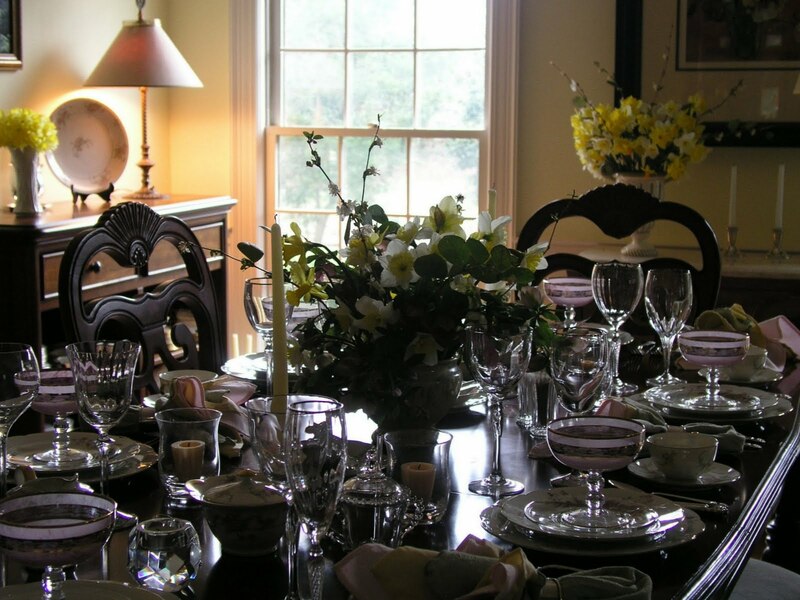 It has been such fun to look at many of your tablescapes in one setting. I too have a wonderful family bible similar to yours and used silver baby cups in my table design this week. My goodness! This is the first time I've visited your "place" and you have taken my breath away. I was relieved to read that other bloggers remembered many of your settings because I was thinking, "This guy made all these this week, one after the other!!!" I am bookmarking this page because you have provided so many beautiful ideas in one place. My goodness Bill! The tablescapes AND images are absolutely STUNNING!!! The image that made the most emotional connection to me though was the table set in front of the window wall showing SNOW outside... God I miss the snow. That shot reminded me of sitting at a cafe in The Metropolitain Musum in NYC watching the snowfall in Central Park about five years ago. Can ya send a little down south?? Thank you so much for sharing these over at Susan's BNOTP! Happy Thanksgiving Bill! Ohhh my goodness...I am speechless (nearly..hehe!) Seriously, I have never seen such a gathering of more gorgeous tables then here, my friend! As I was going through all of your beautiful tables...my thoughts were...that you should author a Tablescaping book...SERIOUSLY!!! Have you ever considered it? 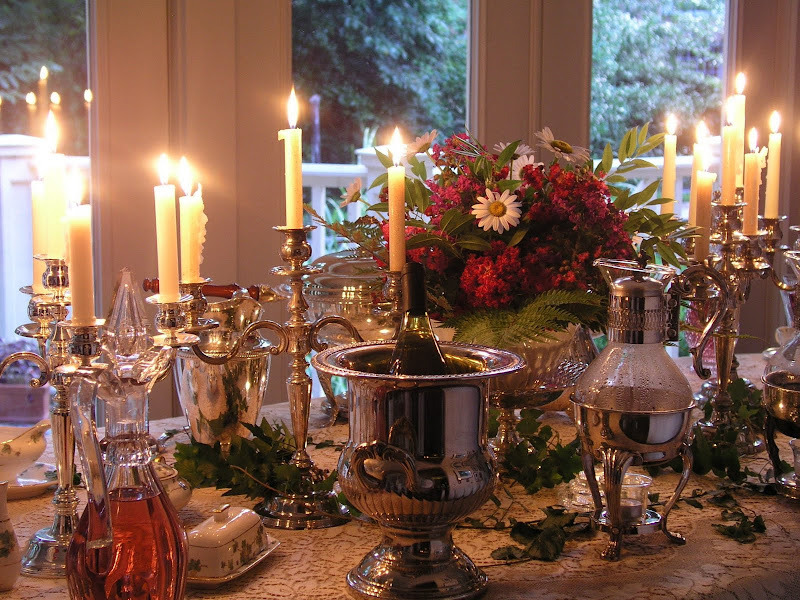 My friend, you have created some of the most fabulous tables in all of blogland!!! Early on, in your post, I thought that I would choose a favorite table to write about in my comment but that idea quickly went out the door when my list of favorites became way too long! Fabulous...fabulous...FABULOUS!!! What a gifting and talent you have...I'm so glad that you share it with us! You and your fabulous tables always inspire me, Bill! Thank you!!! PS...ohh, just wanted to say that I think our very old, family Bible is exactly like yours! That's awesome! Bill, Your tablescapes are breathtaking! Are you a florist or interior decorator by any chance? What talents and creativity you have and Thanks for sharing it wiht us. I have "bookmarked" your site. Your tablesccapes are a bit more elegant than I would normally have but that's because I don't have an eye for putting it all together but I know what I like when I see it and I love all of your tablescapes! Thanks for sharing and Happy Thanksgiving to you. 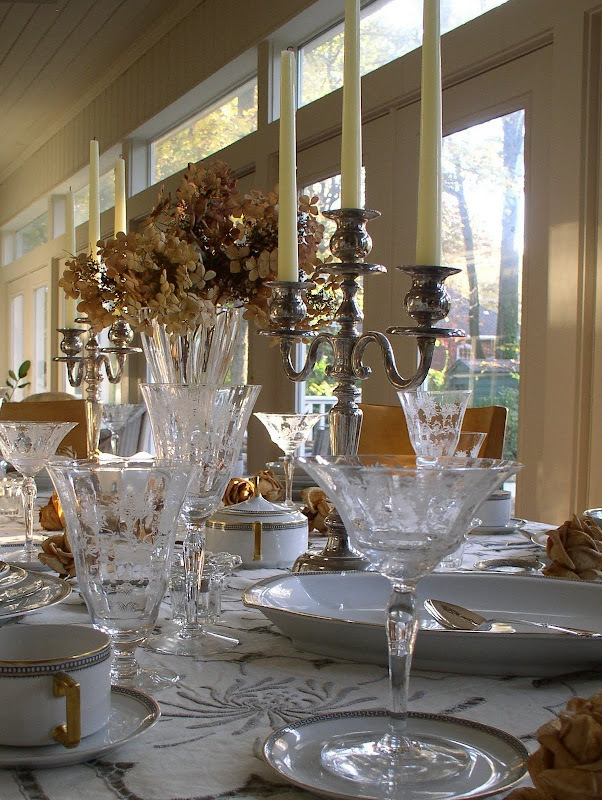 Can't wait to see your Thanksgiving tablescape pictures. My jaw just dropped! I am fairly new to BNOTP, and I plan to look at your tablescapes over and over. I don't want to miss a thing! You have a gift, and I am thankful that you shared this with us. Hi Bill, Your attention to detail AND your huge assortment of breath taking dishes and accessories is always a treat for me to see. Oh how I enjoyed seeing these tables...each one totally different from the next and all equally as gorgeous. Stop by and see my daughter's wedding reception tables if you have a moment. Oh my goodness! I have to come back when I have more time to look at all those in detail! They are gorgeous. I am making 10 centerpieces for a Christmas party in 2 weeks. I hope it stays mild so I can do them outside and not freeze my fingers off cutting all the greens! Bill, so many beautiful settings all with their own flavour and special style. Thanks for sharing your creative inspiration with us all. Hmmm, your own retrospective....what fun! Oh my, each one was more beautiful than the next! You are certainly the master of the floral centerpieces. You put them together gorgeously. And I think the first vignette you showed above was the first time I visited you!! I seem to remember that one as the first I ever saw... I also love your First Pink Saturday photo, I hadn't seen that one before -- I love that feather boa with the hydrangea! It matches! I'm a first time visitor to your blog and did you knock my socks off! So many tables to admire! Bill- you do have a flare for centerpieces, settings and painting..and it makes me miss my husband. He too added that "extra something" to the table bringing magic to our lives. Your home seems to be filled with it! Wow, I was soaking up ideas like a sponge! You have a wonderful display here -- something to fit every situation. Thank you so much for sharing. Oh Bill....you're the BEST! each one arrangement is better than the other! You have so much class, taste and imagination Bill...I could be looking at your posts all day....just loved them all. I love fresh flower arrangements, nothing better than that, I usually do them fresh for dinner or lunch entertaining and now, thaks to you I have great ideas ready! Oh, Bill! this post literally took my breath away. I have been having server issues in St. Augustine, and I had to come home to be able to load all of these fabulous pictures. And I am so glad I got here to see this! WOW! I've seen them before, but all in one place is just STUNNING! You know, I think my favorite ones are the pink and white mixes for centerpieces, but then I see some of the tree branches or the one with the peonies, and I just swoon all over again. You are tops, my friend, tops!